Today in this article you will learn about how “.Tornado Ransomware” virus encrypts files on your PC and places a ransom note that demands payment for decryption. Also further in this article you will learn about the removal process of .Tornado Ransomware. The infamous Ransomware virus has another addition to its ever-growing family. This destructive Ransomware asks for ransom once it encodes important data stored on a compromised system with a sophisticated encryption algorithm. You are advised to take all possible actions in your capacity to cope up with this situation and delete .Tornado Ransomware from your system. .Tornado Ransomware may enter your computer via spam emails, fake software update notifications, and web links to infected sites, shareware and freeware installers and numerous other shady distribution techniques. Spam email are one of the most preferred methods of distribution and poses themselves as mails from trustworthy websites. Usual characteristics of spam emails are. Tricked email address and sender’s information. Text messages that attempt to excite sense of urgency and attract users. File attachment that you need to install and web links that you need to follow. A single click on these file attachments and web links, will automatically grant access to .tornado Ransomware to your computer. Being a part of the data locker Ransomware, “.Tornado” specifically aims at scanning system for predefined files in order to encrypt them. A RSA cipher code is used to encode target data. Encrypted data can be easily distinguished by the extension “.tornado” affixed at the end of their names. For instance “sample.jpg” is renamed to “sample.jpg. [dongeswas@tutanota.com].Tornado” making them unusable. Post data encryption this nasty system threat creates file named “key.txt” and places a copy in each folder which contains encrypted files. Text file here is used to place the ransom note that primarily aims to extort ransom for hackers. The payment needs to be done in Bitcoin, mainly to hide the identity of payment receivers and senders. There is no denial of the fact that cleaning “.Tornado Ransomware” is possible, however restoring the encrypted files is not an easy task and is almost impossible. It is essential to keep a regular backup of your important files and data to reduce the impact of this harmful virus attack. Post successful invasion “. Tornado Ransomware” uses RSA algorithms to encrypt data and places a ransom note on the computer screen. 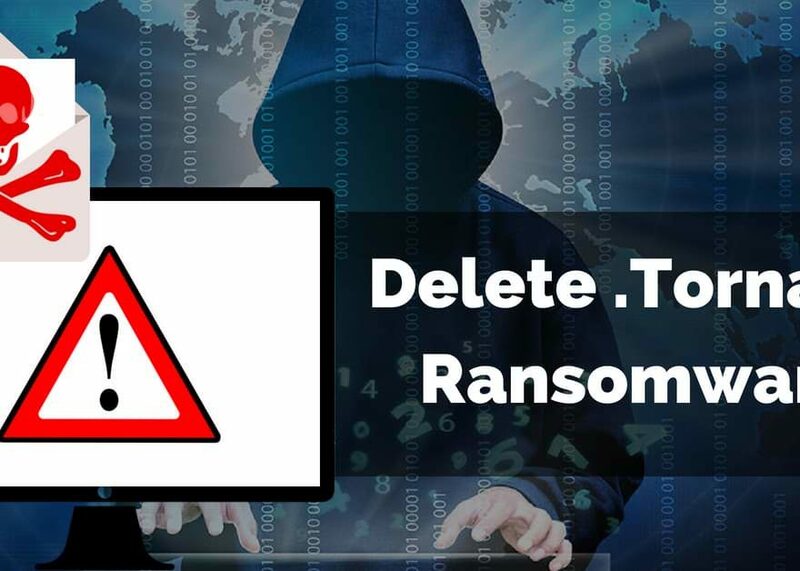 The ransom note keeps popping up on the screen and scares users by stating that without using a decryption key it is impossible to restore your lost data. Your infected computer has high possibilities of crashing. Users are advised to take a backup copy of files on an external device. Restore your system and format your hard drive completely. Reinstall windows and download a good system security software. Data corruption: Encrypts files by adding its own extension making them unusable. Provides remote access: It provides unauthorized access of your system to remote hackers. Disable security systems: Alters the default parameters of firewall system to avoid detection. Malicious codes injection: It creates backdoor for other harmful virus to enter and perform malicious activities. Slow System Performance: Tornado degrades the overall performance of your system with multiple screen freezing issues and system crashing abnormalities. Can I trust .Tornado Ransomware – Should I pay Ransom? .Tornado Ransomware alarms its victim by saying that only decryption keys can restore lost data and forces them to pay the ransom. Unfortunately, it is highly challenging to trust this lethal system infection. No matter how much ransom you pay, .Tornado Ransomware does not give any assurance that you will get the decryption keys to release your encrypted data. Do not fall prey to this nasty malware as paying ransom may also expose your financial details to cybercriminals. Follow simple procedure to delete .Tornado Ransomware completely from your system. Click on the Start button first followed by Shutdown and Restart Button respectively. Once your computer is active, press F8 until you see the Advanced Boot Option on your system screen. From the Advanced Boot Option dialogue box choose Safe Mode with Networking. Press Power button on the Windows login screen. Press and hold the shift key on your keyboard and click on the Restart button. From the list of options choose Troubleshoot followed by advanced option, then click on startup settings and finally press Restart. Once your system restarts and displays the list of startup options choose Enable Safe Mode in Startup Settings window. In the Command Prompt Dialogue box enter cd restore and hit enter. Further type rstrui.exe and press enter. In the new window click on Next button and choose your restore point prior to invasion of .Tornado. Click on Next after this. Press Yes to start system restore. Post successful system restoration, install a good anti-malware program to keep your system safe in future. How to remove .Tornado Ransomware? As per cyber security researchers use of a robust anti malware software will save your system from harmful virus. Download Free Malware removal Tool today to ensure system safety. Follow below mentioned steps to download Free Malware removal Tool. Install Free Malware Removal tool using the link given below. Install and click on the Run Button. Once downloading is completed, Start Scan. List of all detected threats will pop up on your screen. Press on the clear now button to clean .Tornado Ransomware from your pc.